Can a UTI or BV during pregnancy cause premature birth and cerebral palsy? November 14, 2014 /in Infection During Pregnancy /by Reiter & Walsh, P.C. Yes, urinary tract infections (UTIs) and bacterial vaginosis (BV) can cause a baby to be born prematurely and/or have cerebral palsy. If a UTI or BV is not promptly diagnosed and correctly treated in a pregnant woman, the infection can travel to the womb (uterus) and affect the baby. The infections are associated with an increased risk of many pregnancy-related complications. A few studies even show a connection between BV and second-trimester miscarriage. A UTI sometimes has no symptoms. Due to the potential for serious complications, it is standard practice for physicians to screen all pregnant women for the infection. On the other hand, research shows no benefit to screening all pregnant women for BV, but many specialists screen women with a history of preterm birth. It is standard practice to treat all pregnant women who exhibit symptoms of BV. When a pregnant woman is not properly tested for infections such as UTI or BV, and when standards of care for treating the conditions are not followed, it is negligence. If this negligence leads to injury in the baby, it is medical malpractice. If your baby was exposed to infection such as a UTI or BV and now has a birth injury such as cerebral palsy, the attorneys at Reiter & Walsh ABC Law Centers can help. Our award-winning lawyers have extensive experience in the investigation and litigation of complex birth injury cases. 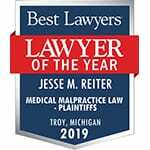 Lawyer Jesse Reiter, president of ABC Law Centers, has been focusing solely on birth injury cases since the beginning of his career, and most of his cases involve hypoxic-ischemic encephalopathy (HIE) and cerebral palsy. Partners Jesse Reiter and Rebecca Walsh are currently recognized as two of the best medical malpractice lawyers in America by U.S. News and World Report, which also recognized ABC Law Centers as one of the best medical malpractice law firms in the nation. If your baby was exposed to infection and born prematurely and now has a birth injury such as cerebral palsy, a seizure disorder or hypoxic-ischemic encephalopathy, we can help. We have helped children throughout the country obtain compensation for lifelong treatment, therapy, and a secure future, and we give personal attention to each child and family we represent. Our firm has numerous multi-million dollar verdicts and settlements that attest to our success, and you owe us nothing until we win your case. Email or call Reiter & Walsh ABC Law Centers at 888-419-2229 for a free case evaluation. Our attorneys are available 24 / 7 to speak with you.